Hi guys! This post is pretty straight-forward. 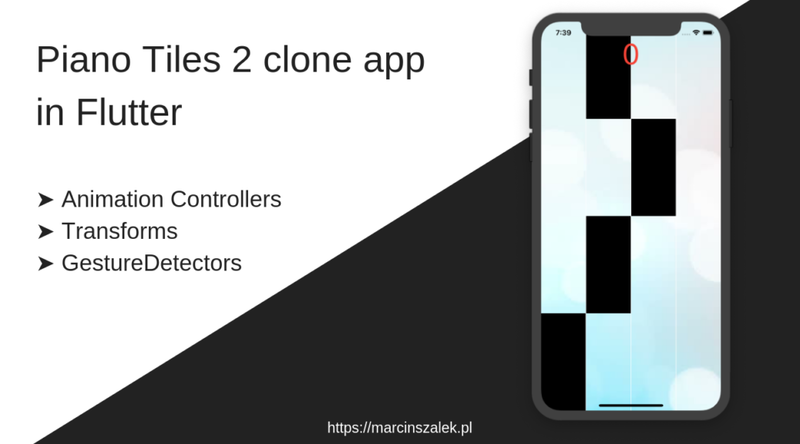 I wanted to create a basic clone of Piano Tiles 2 — a mobile game where you play on a simplified piano. Now I want to share with you how to do that in very few steps using Flutter. Let’s get started! TLDR: Piano Tiles 2 clon app in Flutter, code available here. Every note is represented by its number in the song, the line (tone?) in which it should appear (from 0 to 3) and its state which can be modified from ready to tapped or missed. We use Material so that we can access nice Texts and AlertDialogs, normally you would use Scaffold, which also provides a Material to draw on, but we don’t really need it, so we will use simple Material. We also use Stack – it gives us a way to put widgets on top of each other. Right now what we want to stack is a Row containing empty lines and LineDividers on top of the background image. Let’s start with a Tile widget which will be a simple rectangle of a specific height. Depending on note’s state it can be black, transparent or red. As you can see, for each note we can get what index that note has, therefore we can calculate how much it should be moved from top using Transform.translate. As you can see, the Tiles are moving but they lack smoothness. Let’s deal with it now. At first, we need to notice, that in order for a Line to display moving Tiles, it has to have access to 5 of them instead of 4, because once one tile starts to disappear in the bottom the other one has to show from the top. We can see nice, animated, moving tiles! Now it’s time to handle user taps on tiles. We are going to handle only taps on tiles — not outside of them. To do that we need to use GestureDetector. In the first version of this app, which I showed in my Twitter post, I used GestureDetector’s onTap method. This method gets called, when a child is tapped, meaning when a user quickly puts a finger on a child and the takes it from the child. Seems right, doesn’t it? Except, that if a user releases the touch outside the child, onTap will not get called. Having in mind that our Tiles are moving quickly, it was rather common to touch the Tile, but to pull the finger up when the Tile was no longer there, this way the tap method was not called and the user was frustrated because he knows he tapped it. There is a quick solution to that: instead of using onTap, we will use onTapDown which is called as soon as the user touches the child. Now we can add few adjustments to handling taps. That one is rather simple, let’s have a variable that stores points, display it on the screen and increase it everytime user taps a tile. This way, a tap is only handled if all previous tiles were tapped. Right now the game starts when the screen gets initialized. We can add a flag, so that first tap will cause animationController to start. I am not a musician and I have absolutely no idea what sounds should I use, however, I found some samples I assumed I can use. We will use audioplayers package created by Luan Nico. At first, we need to add the dependency and sound files to the pubspec.yaml file. You can find the notes in my GitHub repository. I will not include video with sound, if you want, you can clone the repo and build it by yourself 🙂 Warning: It ain’t Mozart. The last part is to add logic for finishing the game. As said earlier, we won’t be handling taps on wrong lines, so the only way to lose is to miss the Tile. Implementing that is very easy, all we need to do is modify out animation’s status listener so that it also checks if current(last) tile was tapped, if it wasn’t it means it was missed, meaning game over. To stop the game, we will add isPlaying flag, we will check it during animation updates and we will set it to false when the game is over. 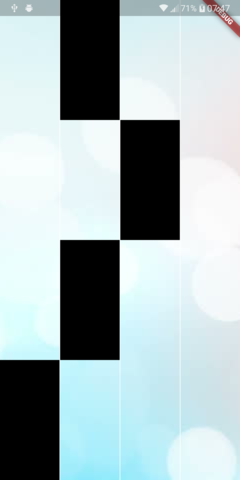 This code only stops the game, in Piano Tiles 2, there is also an animation which indicates what Tile you missed. Theoretically, it might be a problem, as the Tile we missed is already gone, however, if we reverse the animationController, then we should be able to see it again. What is more, we can set the Tile’s state to missed so that it will turn red. Hmm… since we are on the run, why not create a simple popup with a number of achieved points? The last thing we want to do is add simlpe restart function, so that we can keep on playing! I hope you enjoyed this post as much as I enjoyed writing it. If you have any questions, feel free to comment! Originally published at marcinszalek.pl on January 14, 2019.